Highly detailed, hand-sculpted, and hand-painted. Ripped Hulkamania shirt, trunks, and knee pads are all fabric! 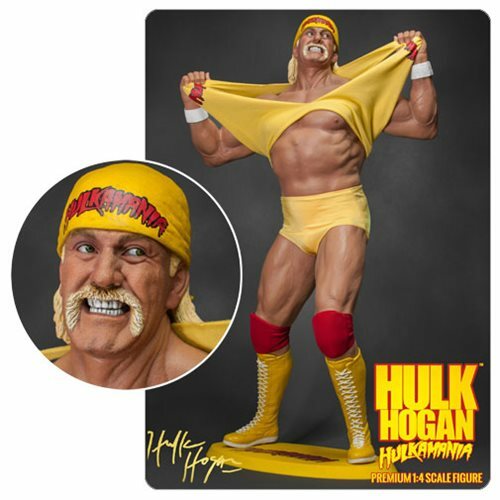 The greatest champion, hall of framer, and the most iconic wrestling superstar of all time - the true legend, Hulk Hogan, also known as Hulkamania, Hulkster, and Hollywood Hogan comes to you as a 1:4 scale premium statue! The red and yellow Hulkamania outfit has created the most iconic fashion in the wrestling entertainment history that no one will ever forget. Storm Collectibles is proud to be the exclusive tag team partner with Hulk Hogan to produce this non-articulated 1:4 scale statue in a high-quality format, made from PVC and Vinyl. This item is a limited production that all Hulkamaniacs and wrestling fans won't wanna miss! So what you gonna do when Hulk Hogan and Storm Collectibles runs wild on you, Brother! Ages 17 and up.